Manufacturer of a wide range of products which include oval gear flow meter, oil flow meter, kerosene flow meter, furnace oil flow meter and lube oil flow meter. Usage/Application Main applications include unloading, transfer and consumption monitoring. control of the pipe liquid flow ,which are typical of Volumetric flowmeter, feature large flow range, low pressure loss, large viscosity range, easy installation, high accuracy and can measure high temperature, high viscosity liquids with easy calibration. 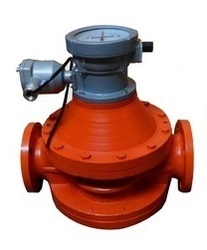 The meters are widely used for the flow measurement in the field of petroleum, chemical, chemical fiber,traffic,food industries and commerce, medical and sanitary departments. Oval gear meter is generally comprised of a flow transducer and a counter mechanism. The main part of the transducer is a measuring chamber which consists of a pair of oval wheels and a sealing coupling. The counter mechanism contains speed reduction gears, adjusting device, counter, and pulse transmitter etc. In the measuring chamber, a pair of oval wheels and cover plate makes a crescent shape cavity which is used as a measuring unit. The oval wheels are rotated by the pressure difference in the inlet and outlet of the meter and drive the inlet liquid through the cavity to the outlet, each revolution of the oval wheels displaces fluid four time the volume of the cavity, the total revolutions of the oval wheels and the revolution rate will be transferred to the mechanical counter, and the total liquid volume and instantaneous flow will be known by the pointer display and the roller integration. The attached signal generator converts the rotary axial angular shift to the pulse signal and then transmits it to the electrical indicator for remote integrated flow and instantaneous flow indication and control. With our expertise in this domain, we are able to offer a superior quality range of Oil Flow Meter. These products are precisely engineered which are widely used for various application areas like petroleum, petrochemical & process control industries. Our products are ideal for fitting into tanks or process vessels so as to control the levels of the liquids preventing the overflow of the tanks. 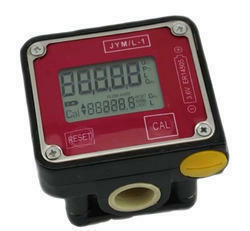 Application Media Meter Suitable for use to measure the total flow of water passing through pipeline in waterworks, mining and industrial enterprises. Kerosene Flow Meter is the quantification of bulk fluid movement.The kerosene flow meter is a kind of Positive Displacement flow meter. As the fluid being measured passes through the meter; it rotates 2 oval gears in measuring cavity to displace a precise volume of fluid. A sensor detects the gear rotation to determine displaced volume and flow rate. Higher Accuracy, 0.5% or 0.2%. 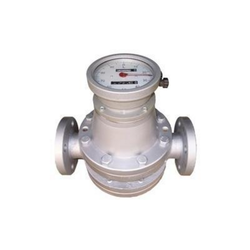 Oval gear flow meter mainly used for high value liquids such as oil,chemical etc. Furnace Oil Flow Meter, Liquid Flow Meter, and Water Flow Meter are widely used for flow measurement of conducting fluid. The Oil Flow Meters, offered by us, is ideally manufactured for ensuring accurate measures for the control of the oil consumption. Furnace Oil Flow Meter /Machine Oil Flow Meter/Big Flow Rate Meter/ Turbine Flow Meter can be used various industrial as well as commercial applications such as Diesel, Petrol, Kerosene, Machine Oil, Edible Oil, Food Oil, Furnace Oil etc. Lube Oil Flow Meter Flow Meters for Lubricating Oil - specifically designed for circulating lube oil in demanding installations. Local flow indication for troubleshooting with mechanical switching and transmitter. Oval meters are instruments used for the continuous and intermittent measurement and control of the pipe liquid flow, which is typical of the Volumetric flowmeter, feature large flow range, low-pressure loss, large viscosity range, easy installation, high accuracy and can measure high temperature, high viscosity liquids with easy calibration. The meters are widely used for the flow measurement in the field of petroleum, chemical, chemical fiber, traffic, food industries and commerce, medical and sanitary departments. Looking for “Oval Gear Flow Meter”?